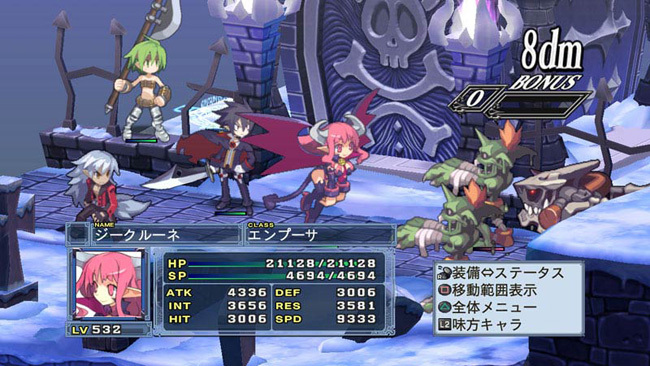 The Disgaea series has always been about the balance between the player’s strategical skills and attempts at logic versus the game’s inherent chaos and abundance of systems. 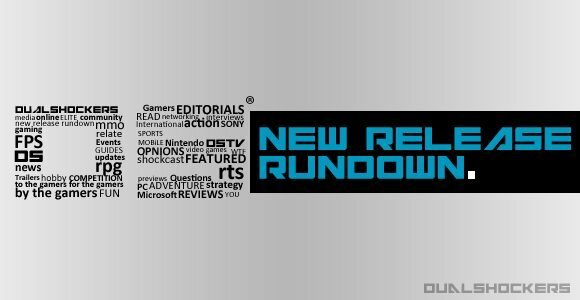 The latest entry in the series continues in the path of the franchise, adding new systems, perfecting old ones, continuing to work on improving that balance. 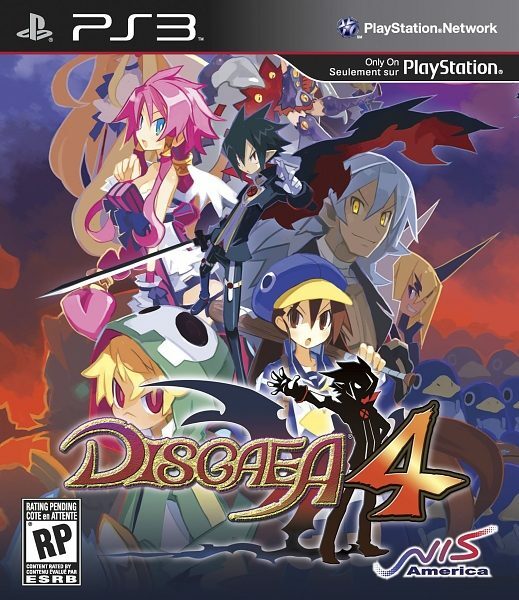 Disgaea 4 succeeds at that, more so than any other entry in the series. That balance it strikes is so near-perfect, the gameplay so fine-tuned, the systems so deep (despite their apparent density), that it results in one of the best SRPGs I’ve played for the past several console generations. 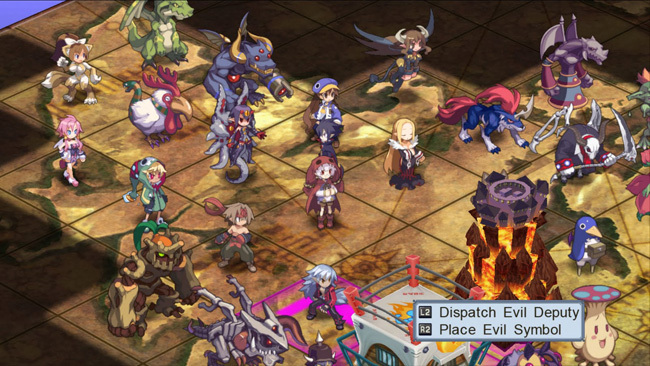 Disgaea 4 has pretty much all of the hallmarks of the traditional SRPG: a wide array of character classes, isometric perspective, sprite-based graphics, etc. If you’ve played a Disgaea game before (or pretty much any SRPG since the PS1 era), you should be aware of all these. 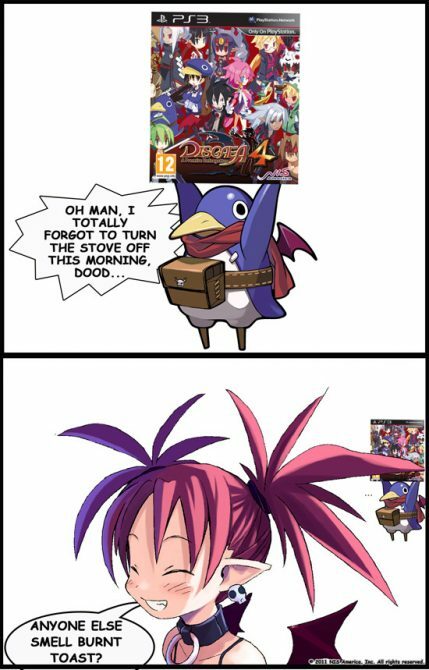 Though we’re two generations past that, the genre hasn’t changed all that much, and Disgaea 4 is a reflection of that. While it does stick to tradition, the franchise is known for focusing on adding various systems on top of that framework, adding onto the strategy and the chaos with each entry. 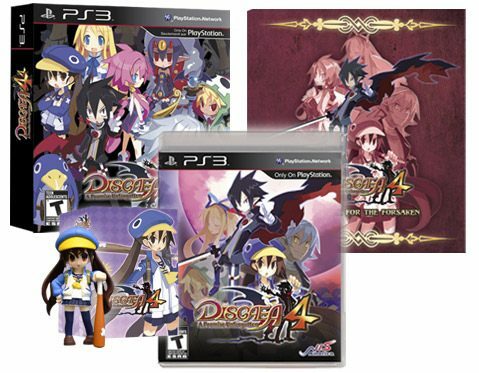 First it was the Geo Panel system, then Item World, and now we have Disgaea 4, which is filled to the brim with all of those systems and many, many more. The main two additions are the “Cam-Pain” and the Item World pirating system. The Cam-Pain is a large map, filled with panels representing each stage you visit in the main game. Each panel can contain one character or one item that you use to boost stats or mess with characters. Through placement of these items and characters, you can spread out Mana and Experience gains, balance your party, boost certain stats, and get certain story endings. It’s really complex, but once you get the hang of it, it really helps with leveling and grinding. Another part of the Cam-Pain is the Senate, where you can pass various “bills” that affect the world, be it through increasing/decreasing enemy levels to make the game easier or get more experience, putting more expensive (i.e. higher level) items in shops, getting more items to place on the Cam-Pain map, etc. There are a ton of bills you can pass, and each one, whether it succeeds or not, costs Mana. When you select a bill to pass, you’re put in the Senate, where certain members will be for you or against you. You can bribe them to your side if you have the items to give them. You can also upload characters that will go to other peoples’ senates, where they will generally cause mayhem and chaos by attacking other members of the senate unless you can persuade them otherwise. Senate hearings can get pretty annoying (especially since they always cost Mana, whether the bill passes or not), but you can always just save scum to get past that, and you can encounter some cool players and randomly generated characters in it. The Cam-Pain is a strong addition to the game, assisting in the grinding, adding another layer of strategy, and, as one would expect, injecting another shot of chaos into the mix to make the game that much more difficult. 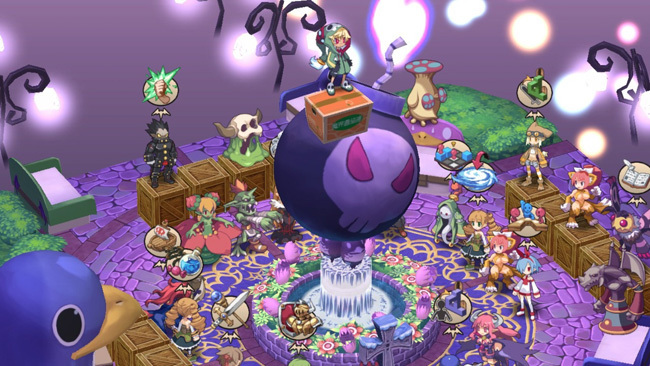 Another other big addition to Disgaea 4 is Item World pirating, an internet-based feature. When you’re grinding through Item World, you have a chance of encountering a band of other players who will appear in a giant pirate ship. These players can attack you or help you with clearing Item World maps, depending on their disposition. These players earn CP (used for custom map creation, which we’ll get to shortly) for their actions. Like with Senate members, you don’t take direct control of pirates, you just upload characters and they do that stuff on their own. The road to becoming a pirate is…long, to say the least. You can only start finding the parts to make your pirate ship after encountering pirates in Item World for the first time, and you might not find that for a good amount of time. A friend of mine didn’t see them until he was about level 1600. But, if you don’t want to deal with other pirates invading your item world, you can switch it off (or set it so that you’ll only see your friends’ bands of pirates) Still, it’s an interesting system (chaotic, as usual), but it’s not so important that you’re missing out on a lot since it takes a while to reach. It’s an excellent reward for people who manage to get that far into the game and its systems. 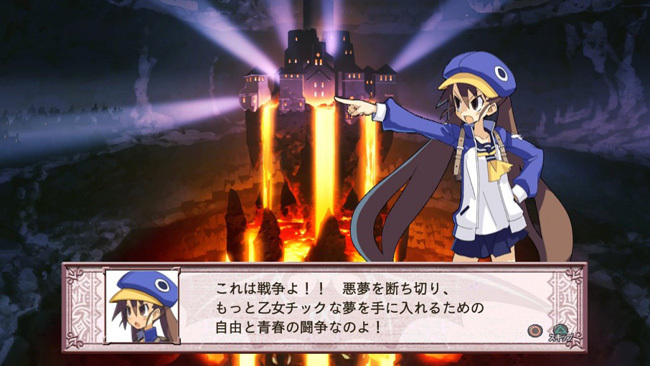 The last thing Disgaea 4 adds is the aforementioned custom map creation. You can create your own levels for the Cam-Pain, and you can even customize your base. The latter is really cool, letting you even put party members in place of the NPCs, and they get some good lines depending on where they’re placed. 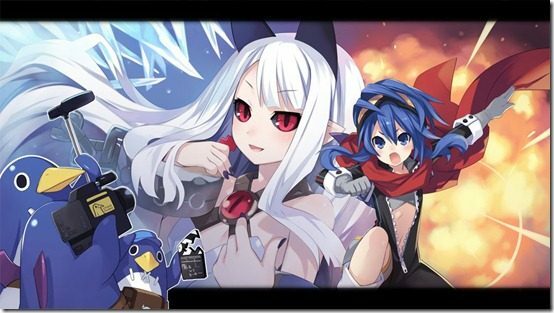 Systems that should be familiar to long-time Disgaea fans are further improved upon in this release. Geo Panels and Blocks are still important parts of fights, and clearing maps requires a good amount of strategy and thought. Alternate versions of stages (like Dark World) are still around. Fusion and magichange are still important, the former helping with leveling and the latter being improved on a bit (items that affect stats affect the stats during magichange). In-game currency is both toned-down and jacked-up in certain ways. Mana is what you’ll be using for most of your character development (as well as for Cam-Pain/Senate stuff), but it’s not very plentiful. Money (HL, pronounced “Hell”) doesn’t matter all that much in the long run, since you can get better weapons from Item World and as rewards for doing well in campaign maps. It only matters when you’re buying weird stuff from Item World vendors, which can include items as much as it can include stuff like music and weird “raffle tickets”, but the latter two categories of items tend to cost over a million HL, at the lowest, making them only accessible to dedicated players. Speaking of music, the game has an excellent soundtrack, one of the best in the series so far. I quite like that you can change the Item World background music if you meet the right vendor; the tracks they give you to choose from really show how good the game’s music is. The art style is excellent as well, though a lot of the polygonal stuff doesn’t look very good. The sprites and interface are all crisp and lovely, which doesn’t make the polygonal backgrounds look very good, but that’s what one’s come to expect from the Disgaea series, so it’s not that bad. It’s an artistic choice, and it’s really up to the individual if you’ll like it or not. The main campaign itself, while not the main focus of the game, is very entertaining. 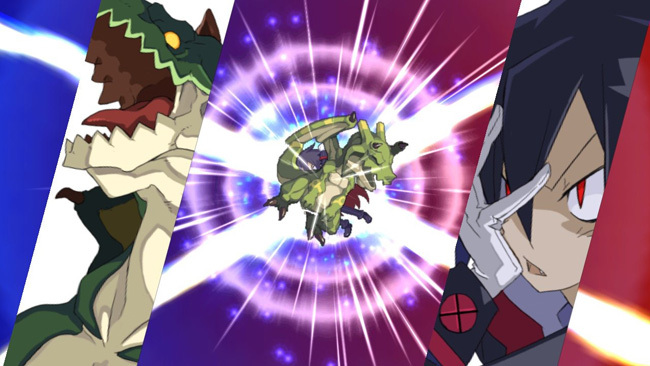 The story focuses on Lord Valvatorez, an ex-tyrant turned Prinny Instructor, who, when the government cracks down on his Prinnies, inadvertently leads a rebellion against the Netherworld’s “corrupterment”. Other outcasts join him, and on his path of rebellion against the corrupt government, he runs into some characters that bring up elements of his past. It’s nothing complex (unlike the game’s systems), and it’s fairly predictable, but most of the characters are likable, and the writing is generally good. There are a few places where the translation went a bit too far to put in a joke, but it works overall. The dub is decent, on the whole. Valvatorez is very well-voiced, with excellent comedic timing. Characters like Fuka and Emizel could’ve been much better. Their voices do fit their characters, but that doesn’t make them any less annoying. Luckily, the game does include the Japanese voice acting if you’d rather listen to it, but then you’d be missing out on Valvatorez’s performance. It’s a catch-22. 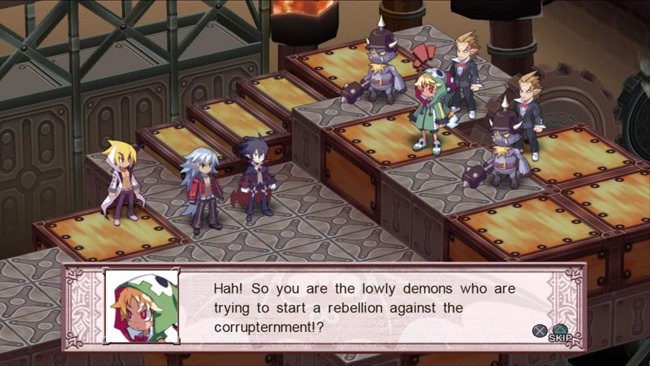 While the plot isn’t the best in the grand scheme of things, the rest of Disgaea 4 is stellar. Even if the plot is predictable, it’s probably the best one the series has done so far, and the systems and gameplay are nearly perfected. It’s easily one of the best, most thought-provoking, deepest SRPGs I’ve ever played, and it’s probably the best one to come out in the past decade. If you like SRPGs at all, don’t miss this game. It’s the best in the series, and it’s got more than enough content for those that love getting deep into SRPGs, though it’s a bit dense for people who aren’t all that into the genre, but I’d still say this is a game worth learning, worth working through, so you can get to the rich, deep systems underneath.